“But they could not find a way to take him in because of so many people. They made a hole in the roof over where Jesus stood. Then they let the bed with the sick man on it down before Jesus. When Jesus saw their faith, He said to the man, “friend, your sins are forgiven.” Luke 5: 19-20. 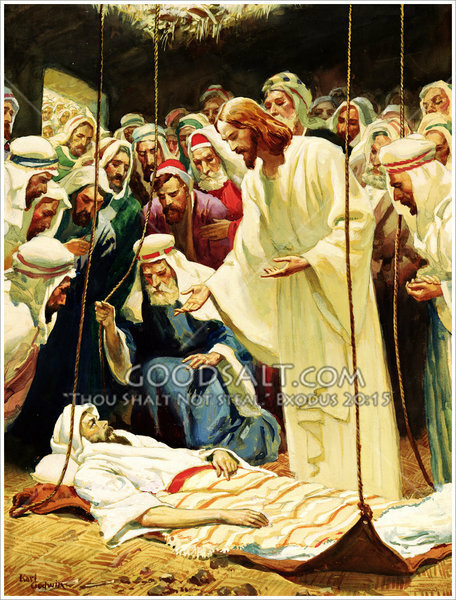 Most of the healing stories of Jesus first involve Jesus forgiving the sins of the person who is afflicted before he heals their physical ills. He sees the spiritual illness above the physical malady. He knows that he can bring more comfort by healing first the spiritual illness by forgiving our resentments and abuses before he tackles the physical pain. This has been my experience. The spiritual harms I have caused to others has brought me more pain than any physical illness. The pain I have brought to my partners at work, my spouse, my children, my friends has been more overwhelming than the physical pain of broken bones or diseased organs. Of course, I have attempted to ease that spiritual pain with many remedies, food, alcohol, work, or busyness so great that I do not have time to think of the wrongs I have done, or perhaps I engage in good works in some other area hoping this will make up for the harm I have done in other parts of my life. The people coming to Jesus do not ask him for forgiveness of their sins. They ask for physical healing. They are deaf or blind to the spiritual ills that are blocking them. The good news is that Jesus knows where our pain is greatest even when we do not know it, and he lets us know that we are forgiven even before we ask! This does not mean that we do not need to ask for forgiveness. My experience is that until we are aware of our sins and ask for forgiveness we live with a terrible emotional pain. Some times we do not know where this pain is coming from, we just know it is there. This story also always reminds us that often it is our friends who bring us to Jesus for healing and forgiveness when we are crippled, out of answers because the pain relievers are no longer working. Awareness comes with prayer, spiritual exercises, spiritual direction, dreams. The good news is that once we have some awareness, the Gospel tells us that we will be forgiven even before we ask! It is like going to your supervisor to ask for a raise and knowing before you get there that you will receive it!